It’s spring, when a young heart’s thoughts turn to those of love…or is that just limerence? Ah, the joy of another new word. I thought there were phases of love, yes, but I knew nothing of the word limerent, coined by Dorothy Tennov in 1977. She described an anxious form of attachment, much like the infatuation of early love, but which varies according to the uncertainty associated with the LO (limerent object). Instead of affection decreasing if the LO seems uncertain, the affection and efforts to persuade grow stronger with such uncertainty, until it is plain that nothing will come of the relationship. Apparently, this can go on for years. It’s like being endlessly twitterpated. I am reminded of the book I received one Christmas, where the lady of the house was forced to endure the gifting of the entire crew of the Partridge in a Pear Tree song as her love tried to woo her. 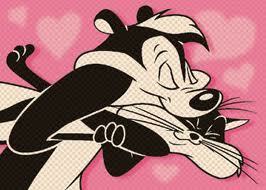 Or of the Pe Pe Lepew and Penelope Pussycat relationship, where he tries more and more extreme approaches to win her heart. Until he gets her. Then he flees. Of course, one wonders about the LO’s role in all of this. Does he/she lead the limerent on? According to most reports I could read, this isn’t the case – a lot of the mental anguish is internal and self-inflicted and the object often isn’t aware of it at all. Still, he/she must wonder at the flood of affectionate gifties and such. Intersperse liminence with the natural urge to be kind to people and you can just see where people get into horrible messes. A recent online chat mentioned the need to be clear about breaking things off to avoid stimulating the limerent among us into a renewed frenzy of activity and adoration.